BOSTON, June 6, 2011 — Technomad is set to introduce the world’s first completely weatherproof, all-in-one, self-casing portable PA system for the commercial pro audio market at InfoComm 2011 (June 15-17, Orange County Convention Center Orlando, Booth 537). The DragonFly, adapted from Technomad’s rugged military technology, is ideal for mobile pro audio and staging events that require outstanding audio quality, lightweight portability, quick setup, ease of operation and durable construction for outdoor events. The self-casing, 100-percent weatherproof design fully protects the system components from moisture, dirt, shock and other elements in outdoor environments, supporting everything from ceremonies and parades to sporting events and concerts. The inclusion of green, rechargeable and long-lasting battery power, along with a potent audio output, supports mobile audio free of extension cords for crowds of approximately 2,150 in size. NiMH battery technology, which uses nickel-metal hydride materials, is far more energy-efficient than lead-based batteries used in many portable audio systems today. The DragonFly offers a uniquely small form factor for a fully functioning PA unit, sized at 14-1/2”x8-1/4”x14” and weighing 28 pounds. It contains two Technomad loudspeakers (expandable to four) and a 200-watt amplifier, and is one of the only portable PA systems to offer an integrated four-input mixer with individual controls. Collectively, the professional audio features provide a powerful output with broad dispersion, projecting intelligible speech and high-quality musical reproduction over long distances and wide areas. The weatherproof design extends to water submergence when in case-mode, providing complete protection in unusually wet weather. The DragonFly even floats when in case-mode, with rear controls and screens remaining visible through a clear hatch. The operator can resume making adjustments using the weather-resistant controls once opened in a safer environment. Other standard features include 16+ user-selectable channels for UHF applications, an integrated wireless microphone and an expansion bay to support an additional mic and a CD player. Network interfaces for streaming audio to other PA systems or receiving audio over a network via a wireless connection are included. Users can also add a Technomad Schedulon mp3 playback and recording system for instant, manual playback of user-loaded audio; or automatic playback of files (single-, multiple- or repeated-play) through down-to-the-second scheduling. The convergence of neo-driver, amplification and NiMH battery technology supports the compact, lightweight and high-powered portable PA design. 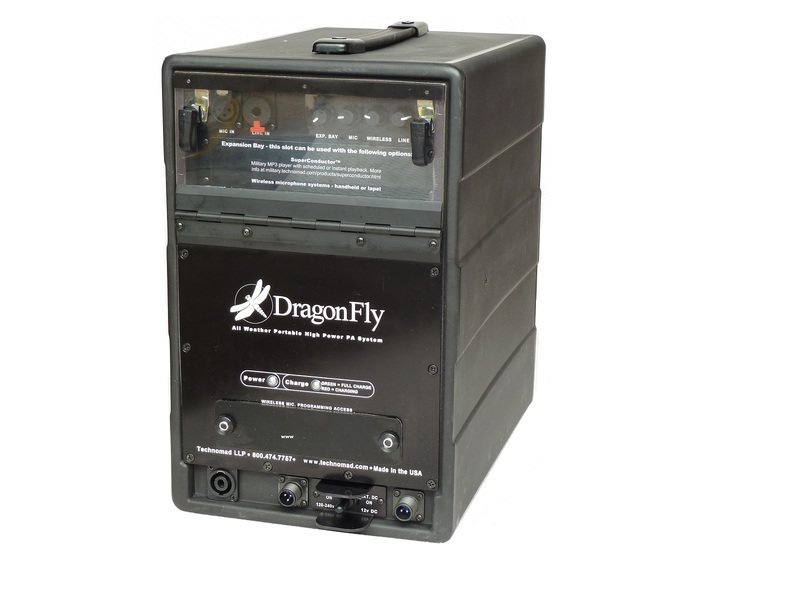 The internal NiHM battery comes with a charger for powering up in the field, and the unit operates on 120-240VAC and 12-24VDC power — making the DragonFly also useful as a fixed indoor or outdoor PA system, temporary or permanent. The DragonFly begins shipping on July 1. Brian Galante is owner and president of Dimension PR, a technology-focused public relations agency. This entry was posted in Articles and tagged Audio, live sound, mobile, ProAV, Technomad. Bookmark the permalink.